Seventh Graders, how are you liking SJHS? Ever wonder how the seventh graders are liking being in junior high? Since this is their first year in Junior High, it is a big difference from being in Elementary School. Josh Larson said that he likes the junior high a lot better than Elementary. His favorite part about school is P.E. and Science. He says that he loves P.E. and that science is fun. Josh likes having a locker, sometimes. Josh got it lucky this year because he says that his classes are really easy to get to. Karly Hickman says that the school is overall, pretty good. She said, ”I like Quest because you can really do anything you want.” She has a top locker and says that it is okay but would prefer a bottom locker. Karly, agreeing with Josh, says that it is easy for her to get to one class to another. Will Udall says that the junior high is going good for him. His most favorite part of school is P.E. because he gets to see most of his friends. He says that he enjoys having a locker, and that it is easy for him to get to all of his classes without having tardies. Mia Roberts says that school is alright for her. She says, “There is a lot of freedom and it is way better than Elementary School.” She even said that she has a bottom locker and that she likes it! It is also easy to get around the school. Bradey Mortensen said that school is going good for him. His favorite part about school is when he gets to be with his friends, because he said it makes school fun for him. He doesn’t mind having a locker and he says that it is easy for him to get to all of his classes. Ashley Edwards said, “ School is fun and really good.” She says that she likes having the freedom that we get because they treat you like an older kid that you are. She likes having a locker and that it is really easy to get to all of her classes. Glad you are all liking junior high! They’re Not Just Knights, They’re Super Knights! Here at Springville Jr. High, we are all knights. However, some of us go above and beyond and become Super Knights! According to the student handbook, Super Knights must be “an effective communicator, responsible citizen and successful learner.” Recently, we had an assembly awarding the Super Knights for the months September and October. 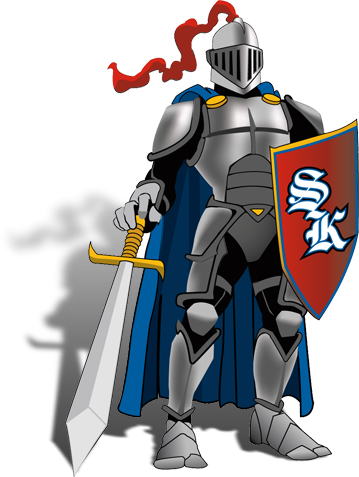 The Super Knights for those months are; Cheyenne Young, Adam Ferrin, Arianie Perez-Diaz, McKay Dalley, Katie Jackson, Monte Taylor, Sarah Hubbard, Isaac Miles, Anna Bird, Victor Chavez, Abby Carlton, and Matt Johnson. Getting the reward of the Super Knight results in mixed feelings. According to Katie Jackson, a ninth grader who got the Super Knight, she was very surprised and shocked. Adam Ferrin, a seventh grader who got the award, had similar feelings. He says, “I was shocked and happy.” Isaac Miles, also a seventh grader who got the Super Knight, said he was very excited even though he had already found out earlier. Great job again to all the Super Knights! You guys make our school a better place! If you want to be a Super Knight, be sure to be an example around the school! Who’s undefeated this 2016 fall season? Springville’s 9th grade football team! A lot of the players have been playing for most of their life. They put in a lot of hard work to come out on top. All in all playing against all the teams was really fun. They have some great coaches, family members and inspirational idols for their support system. They enjoy playing against their rivals, Salem. The last game they played in which they earned the title of being undefeated the score was 47-7 with the win! Tyler Kelly and Lincoln Wright, two players on the team, both agreed that it wasn’t too hard to win. Mike Wakefield and Dakota Pace, two others players thought it was hard. Another player on the team, Clint Mickelson, said, “There was a lot of hard work put in, in the end you got to see who stuck out and who were some of the strongest players.” Even though there was so much work put into beating all the other teams it was really fun for them all. When achieving so much you have to have teamwork. You have to work together. Clint said, “I love all of my team. We’re like brothers. We rely on each other.” “I like them. Super fun, amazing people.” Mike said that’s how he feels about his teammates. Dakota said his team is “Very supportive. It’s not an individual game.” Tyler and Lincoln said that they like their teammates, “Bond, all get along really well. We’re like a family.” Tyler, Lincoln, Dakota, Mike, and Clint all like their coaches. “Amazing coaches. Pushed us and made us do more than we ever thought we could.” Clint said. These young men have many people who’ve helped them. Family members, friends and big time players. Clint’s head coach on the team helps him a lot. His coach helps him “give it my all.” Clint said. Dakota looks up to the quarterback on the team. Tyler’s inspiration is a professional football player, Lamar Jackson. Lincoln got a picture with another pro player named Kyle. Tyler’s grandparents, mainly his grandpa has been there for him. Dakota’s uncle has really helped him with football. The other three boys, Mike, Lincoln and Clint their dad’s were a big help. Clint didn’t really want to play this season but his dad pushed him to continue playing and he’s glad he did. Tyler and Lincoln having been playing football since second grade. Mike and Clint have played since third grade. For five years Dakota has been playing. With the many years of experience all of them have it’s no wonder they are number one this season. Everyone around the players have an impact on their game. Family, friends and professional players are always there for them along with their school and community. Hard work is key but it’s important to enjoy what you’re doing. Congratulations on being undefeated this season boys!! We have a variety of bilingual students at Springville Junior High, which is definitely a plus for our school. It gives us a pop of diversity. I talked to about four student who all shared the same first and second language. All of the students who were asked speak Spanish as their first language and English for their second language. For some of them learning English wasn’t very hard, but some found English very weird and confusing. The longest it took for one student was about six years, the shortest was a month. Many of the students were able to learn from school, neighbors and parents. It came easy for some but not everyone. One student had told me it was hard because people would use words she hadn’t learned yet. Grammar was also an issue at times because English is a very weird language. Overall they like being able to speak two languages. It takes a lot of smarts to know two languages. Did you know that here at Springville jr High School we have a program called Latinos In Action? Students here at SJHS take the class and seem to really enjoy it. The purpose of Latinos in Action is to “help others, make the Latino community stronger, prepare for college and to be a better leader,” said the Latino in Action members. Members of Latinos in Action play a big role in our school. Latinos in Action plan the school's special events. That’s not all they do, they also go out and tutor kids at an elementary who need help. Latinos in Action is an elective. You have a choice whether to take it or not. Most of the kids in the class enjoy it very much. They like being able to help out and learn about getting into colleges and life skills which is very beneficial. Latinos in Action is an awesome group and always doing something great for our community! The 9th grade girls had basketball tryouts at SJHS on November 7th and the 8th. SJHS has a boy’s and girl’s basketball team, but today we are just focusing on the girls' tryouts. It is always exciting to watch basketball especially if you're a fan, so let's dig in. Good luck to all the girl’s trying out for the SJHS basketball team! Books are awesome and fun. Here are some people's favorite books. Aubree Erickson likes The Goose Girl by Shannon Hale because she can get through without problems. Angela Lopez loves Wonder by R.J. Palacio. “I can relate to story,” she says. Kodi Cottam likes The Selection by Kiera Cass she thinks it’s funny and likes all the action and romance. Jocelynn Garner likes The Giver by Lois Lowry because she likes dystopian worlds. Jocelynn’s favorite character is Fiona (from The Giver) because she’s mysterious. Ani (Goose Girl) is Aubree’s favorite because she tells us Ani proves that girls are strong. Angela admires Auggie because he doesn’t give up. She feels like she can relate to him because she says “People say stuff behind my back and sometimes I get bullied.” Kodi admires Marley because she does what's right. Kodi want’s to be Amberly because she is the queen. Jocelynn want to be the mom so she could have her cool job. Mr. Shields is a U.S. History teacher at Springville Junior High School. Lots of people know him, but there are some that don’t. In this article, we’re going to find out a little bit more about him. For people who don’t know him, here’s your chance to find out. And for those that do know him, maybe you’ll learn something new. This year, it is Mr. Shields 30th year of teaching. He has taught at many other schools besides SJHS. Some of these schools include TH Bell Junior High in Ogden, Morgan High School in Morgan, and Payson Junior High. He was at TH Bell for 7 years, Morgan High for 8 years, and Payson for 5 years. He has been with Springville Junior High for 10 years. Besides History, Mr. Shields has taught other subjects such as Utah History, Geography, P.E., World History, and Weight Training. “My favorite part about teaching is developing a relationship with my students and hopefully inspire them to be a better person and prepare them for their life after school. I also love teaching the more interesting parts of history,” he says. Most of his students fully enjoy his class and love to learn with him. Mr. Shields was a college student before he started to teach, and worked some summer jobs doing construction to help pay for school and life. After he retires, he says he doesn’t really know what he’s going to do for sure. “...my wife and I would like to travel more, go on a mission, and spend time with our grandchildren,” he says. So, there you have it. Mr. Shields will go down in history as being one of the greatest history teachers Springville Junior High has ever seen. No this article is not about the premiere of the ‘Walking Dead’. If it was I’m sure those of you who watched it would cry right now. Sorry Glen, you'll have to come back in a different article! This is about the day of the dead. Halloween has just barely rolled over SJHS and on account of that Mrs.Edman has started her tradition of Day of the Dead. She finished up her decorations on Monday and we have some pictures of the classes amazing work. From hand made paper flowers to learning more about the mexican culture, this is a great way to celebrate this holiday. Mrs. Edmans’ third period has made an amazing display in and outside of their classroom, you should check it out down the Q hall! It displays Spanish text that may used during this holiday such as “El Pan de Muerto”, translated to “Bread of the Dead. It’s a type of sweet roll traditionally baked in Mexico. “La Ofrenda” which means an offering, or “Las Calacas” is a type of skeleton. Mrs. Edmans decorations are awesome and her students worked hard to help make it! Get to know the Ladies in the Front Office! Did you ever wonder who calls you down to the front office? The ladies in the front office and the finance office are a big part of our school and now you get to learn more about them and what they do everyday. Ms. Bales, the lady in the Finance Office has been working at SJHS for 22 years. She explains that she enjoys meeting new kids every year and she also explains her typical day in the finance office by saying, “Typically I make sure all the subs are here and I take receipts for kids and I pay bills for the school.” Ms. Bales explains that her favorite part of the day is interaction with the teachers and students. If Ms. Bales could change anything in the school she said, “I would turn us into Jr. Red Devils and cut the Knights. Ms. Davis, one of the other ladies in the front office, has only been working here since the start of the school. Although she has not been here a super long time she says that it has been fun to get to know the kids. For Ms. Davis the typical day for her is, “We start helping when we get here in the morning and we help kids and take calls, but as soon as the bell rings we are working.” She also says, “The whole day is my favorite part but I love helping kids and parents.” If she could change one thing in the school she explains that she would leave it the same because the structure is good and she would leave the rules the same. Since this is Ms. Davis’ first year, make sure you pop in the front office and say “Hi” to her to make her first year great. And don’t forget to also say “Hi” to Mrs. Davenport and Ms. Bales to make their years great as well.